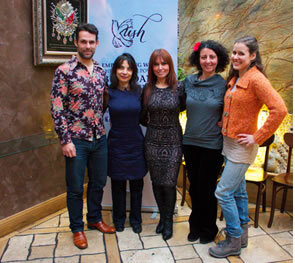 Putney resident and renowned dancer Melisa Yavas is launching Kush (Turkish for ‘bird’), a unique series of workshops designed to help women “find their natural rhythm” through bellydancing and complementary activities. At an event last week to introduce the concept, founder Yavas and her Kush team of experts, yoga instructor Alex Hanly, sound therapist Laura Valenti, meditation specialist Elif Clarke, and percussionist and dancer Guy Schalom, shared their expertise and demonstrated how the sessions will help women to improve their understanding of, and relationship with their minds, bodies and other people. The new women-only Kush workshops will be running monthly in Studio B at London’s home of dance Sadler’s Wells from 26 February 2013. Centred around bellydancing and fused with complementary activities such as yoga, meditation and sound therapy, each two and a half hour session will address a specific aspect of a woman’s life, helping to enlighten, invigorate and empower them. Alex Hanly specialises in yoga linked to the lunar and women’s menstrual cycles. She drew gasps from the females present when she described menstruation as “a gift for women”, saying “those who experience pain should see this as an example of imbalance in their body”. She explained how Kush will hone in on a woman’s sensual zone, encouraging women to “get the belly out” through bellydance and yoga, so they can move beyond the pain to “enjoy what it is to be a woman, finding more balance and comfortableness within and outside of themselves”. Cognitive behavioural therapist Elif Clarke ended the session leading the guests in meditation. Women of all ages can attend the Kush workshops, as long as they are in reasonably good health and open to the benefits of alternative therapies. Kush currently only runs in London. Melisa Yavas and Guy Schalom feature in all the sessions, together with a different expert therapist for each workshop. The first three are titled ‘Relationship’ (26 February – meditation with Elif Clarke), ‘Acceptance’ (26 March – sound therapy with Laura Valenti) and ‘Naturally Balanced Female’ (23 April – yoga with Alex Hanly). Each workshop is priced at £30 or £35, with a £10 discount if all three sessions are booked together. The number of attendees is limited to 25 persons per session. More information and bookings are available on www.kushproject.com.